The Duquesne University School of Pharmacy student chapter of the Pennsylvania Pharmacists Association - Allegheny County Pharmacists Association (PPA-ACPA) held its annual Self-Care Competition on January 18, 2017, in the Africa Room of the Student Union on the Duquesne University campus. Sponsored by Giant Eagle Corporation, the competition is a cross between "Jeopardy," "Who Wants to Be a Millionaire," and "Hometown High-Q." In this forum, student teams of three are challenged with questions relative to over-the-counter medications, herbals, and self-care. Members of the faculty, as well as School of Pharmacy residents, generated categories and questions for the competition and further served as judges, scorekeepers, and timekeepers. John DeJames, Manager of Clinical Programs-Special Projects with Giant Eagle Corporation, served as the competition moderator. 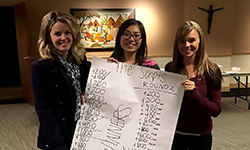 As members of the winning team, PYIII student pharmacist Mary Kimmel and PYIV student pharmacists Kiana Motto and Alvina Tran advanced to the state-wide competition held at the Pennsylvania Pharmacists Association Mid-Year Meeting on January 27, 2017, in Lancaster, PA.
"The self-care competition was a lot of fun! I was very proud to be able to represent Duquesne School of Pharmacy at the state conference in Lancaster. It is a great learning experience and I feel I have taken a lot away from my experience," said Mary Kimmel.